1 x Mist maker. The spray head should be flat, the water surface should keep more 5-10mm higher than prominent water lever probe. Do not out the spray head in the water with high concentration acid and high alkali. Small contemporary plant blossom and leaf-inspired tabletop water fountain - Copper and green painted metal and resin construction with LED light - 1 submersible electric water pump with 0.5" diameter hose, LED light - Easy assembly, plug into standard indoor electrical outlet - Dimensions: 9" Diameter x 10" H; 2 lbs - Small contemporary plant blossom and leaf-inspired soothing electric indoor tabletop water fountain for kitchen, living room, bedroom, den or office - Each fountain features copper and green painted metal and resin construction with LED light - Includes one tabletop fountain, one submersible electric water pump with 0.5" diameter hose, LED light, and an electric transformer - Easy assembly, plug into standard indoor electrical outlet. Below this level will not fog or mist is very small. Depth enough to cover the atomizing head side door black font 1-2CM appropriate level sensor, the water is too deep will not fog. Turn on the power, you can spray. 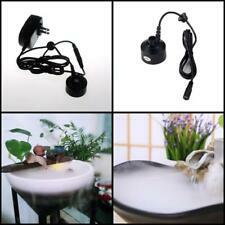 Note: This item is only a Mist maker, the AC adapter is not included. 1 xMist maker. No heat or chemicals used. Working water level: 40-60mm. Best for indoor or outdoor fountains, water feature, and office use. AquaFlame LED LIGHT Candle flameless Fountain Light with Timer 5" x 8.5"
Beautiful set of three textured black metal indoor waterfall fountains with river rock base and sepia tinted mirror front. This is a totally unused item that was never removed from it's box. re-taped over. Check photos. Trending at C $54.01eBay determines this price through a machine-learned model of the product's sale prices within the last 90 days. Tabletop size. Never any handling fees! The spray head should be flat, the water surface should keep more 5-10mm higher than prominent water lever probe. Do not out the spray head in the water with high concentration acid and high alkali. 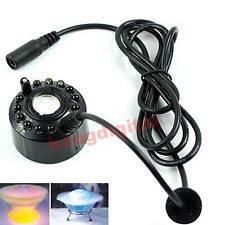 With 12 LED colorful light. Keep it clean. Application: Fountain. Don't touch the atomizing slice while the Mist Maker is working. 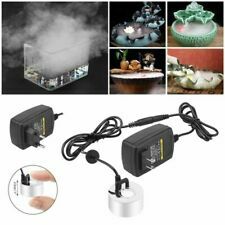 1 X Mist maker. Ensure the water at high quality, use clean tap water. 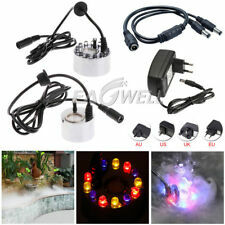 Type: Outdoor Lighting, Underwater Lights. 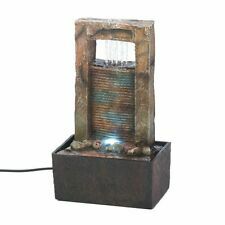 NEWPORT COAST COLLECTION COLOR CHANGING RUSTIC VASE LED FOUNTAIN. ITEM IS NEW IN BOX AND NEVER TAKEN OUT OF BOX. This water fountain features a glass ball sitting on a fence post. The glass ball is lit up by a LED light, illuminating the fountain at night. This 'Pots on Bucket' design tranquil water fountain will help to create a calming, peaceful atmosphere in your home or office. A gentle stream of water flows from the glass ball & flows down 3 levels into a bucket then down to the base. The water stream provides a soothing, natural trickling sound to help you relax. Made with stunning detail & individually hand finished for that extra special touch. Includes everything you need - simply fill & plug it in to power! Instructions included. Measurements Height: 19.5cm Side Width: 10cm Front Width: 16cm Weight: (Unpackaged and with no water): 682g Material: Poly resin & glass ball. 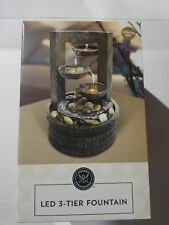 Multi Color Resin Water Fountain 6.69x4.9"
Homedics Mirra Oceanside Indoor Fountain Lighted Tabletop Warm Glow Rock NIB!